Sunday November 12th 1893 It was late when we got up but got around with the work in time to go to church. I soon got dinner over and Will took me a ride out east of town. It had turned quite cold. we spent the rest of the afternoon and evening at home. 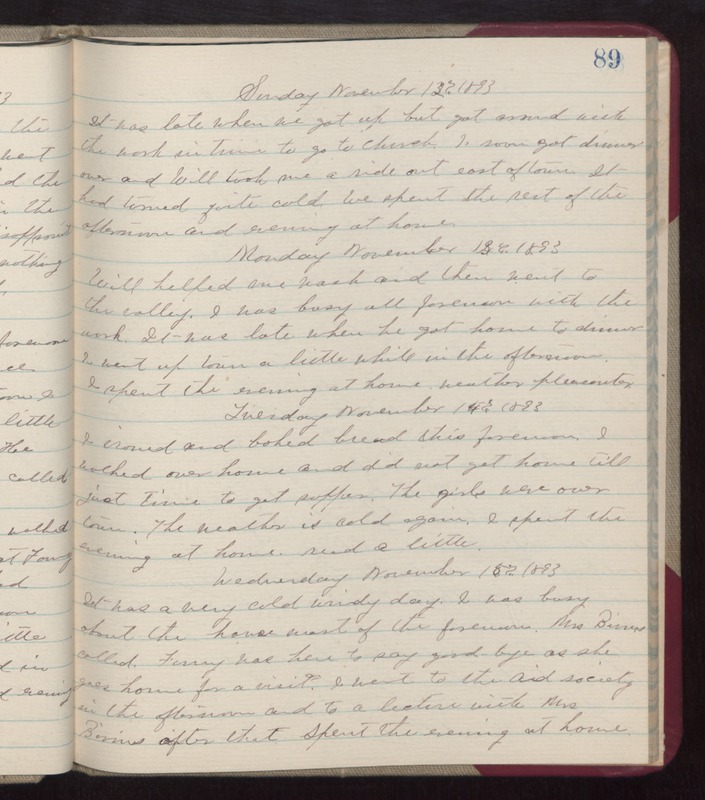 Monday November 13th 1893 Will helped me wash and then went to the valley. I was busy all forenoon with the work. It was late when he got home to dinner. I went up town a little while in the afternoon. I sent the evening at home. weather pleasanter. Tuesday November 14th 1893 I ironed and baked bread this forenoon. I walked over home and did not get home till just time to get supper. The girls were over town. The weather is cold again. I spent the evening at home. read a little. Wednesday November 15th 1893 It was a very cold windy day. I was busy about the house most of the forenoon. Mrs Bivens called. Fanny was here to say good-bye as she goes home for a visit. I went to the Aid society in the afternoon and to a lecture with Mrs Bivens after that. Spent the evening at home.